We see occasional queries, from blog owners who require separation of their blog ownership from their real lives, in Blogger Help Forum: Learn More About Blogger. I want to have myself anonymous, so that people do not know who I am when I blog. i think it will contribute to a more exciting blog! An air of mystery is OK, as long as it's not being used to mask criminal activity. Taking a public account and blog, and removing all personal details, can be an exercise in futility - or at least, ingenuity. Blogger / Google code contains details, which may reveal too much. We know that Blogger permits us - and will support us - to publish a blog, anonymously - with our blogging and real life identities kept separate. They don't provide details, though - possibly because each person may have their own ideas how separate they want everything to be. Both Blogger accounts and blogs contain obscure details, which might be exploited by someone who is experienced in identity tracing. One detail, which is frequently used in blog ownership analysis, is the "me" tag, in the blog header. 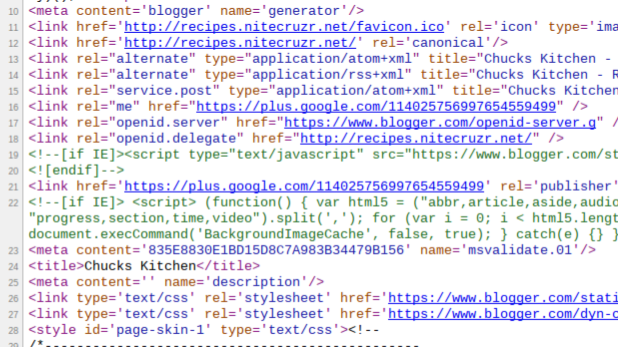 The "me" tag is not documented - it's just there, in the blog source code. Who knows if the "me" tag in my "Recipe" blog, leading to my Google+ profile, could one day lead the wrong person to my door? 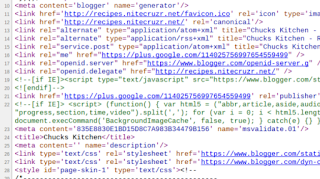 Who knows what other details may be present, in a Blogger / Google profile, or blog internal code? For true anonymity, start with a clean account and blogs. If you want true anonymity, start with a new Blogger account which contains no personally identifying content. And if possible, delete your current Blogger account. Then setup a new Blogger blog - and again, add no personally identifying content. And do not link between anything in your clean, new Blogger account, and anything in any other accounts. The best chance for anonymity starts with 100% isolation of the new Blogger account. Conduct frequent personal identity audits, and educate yourself. As you publish your blog, look at each opinion and story, and ask yourself how this could be used against you. Spend some time on the Internet, and read about identity verification, pursuit of fugitives, and similar detective work. Spend some time reading stories about the US Witness Security (WitSec) Program, and similar programs in other countries - and how they protect their clients. Their stories could become your learning opportunities. True anonymity will have disadvantages. If you truly make yourself anonymous, there will be no backdoor authentication details. You will not be able to recover control of the blog if you ever forget the account name or password. If you remember account / password, you may not need backdoor authentication. Neither Blogger: Forgot your username or password? - or Google: Having trouble signing in or viewing your blog? 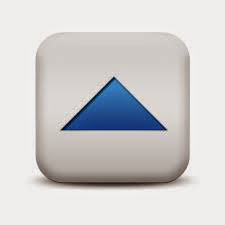 - will have any details which can be used to recover access, if you become truly anonymous. If there are any such details which could be used by you, to recover access or control, those details might be your downfall, when an experienced detective is put on your trail. You will need protection from Google Hacking Detection, eventually. If your account gets locked from "suspicious" / "unusual" activity, or when you change computers or travel, you will need anonymous backup authentication. You will need one or more components of Google 2-Step Verification. Just recording account name / password in a password storage vault won't help, if Google Hacking detection becomes involved. You're going to have to have some backup authentication - just choose what you use selectively, keep it up to date, religiously - and never lose it. Some #Blogger blog owners want to separate their blogging and personal lives - and want their blogs to not lead anybody to their real life existence. This can conflict with effective blog publishing - as a blog, by design, is an online extension of ones real life. Given enough forethought, and research, it may be possible to separate our online life from real life - but it won't be a one time activity. Personal online anonymity will require constant self examination, and preparation.